Arunachal Pradesh congress committee (APCC) while attacking the BJP led centre government and supporting the Bharat Bandh against the price rise and Arbitrarily increasing of fuel price in country have appeal the people of state to support the 10 hours congress sponsored Arunachal bandh from 5 AM to 3 PM on Monday. 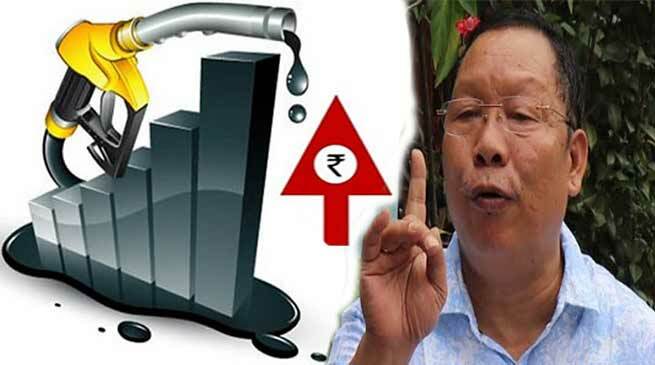 In a media briefing here today APCC President Takam Sanjoy said that the value of the Indian currency is going down on one side while the price of petrol and diesel going up. How can the people of the country will tolerate and how can a normal and middle class people can afford such price rise of essential commodities in the market including the fuel price. He said that state executive meeting held on September 8 have expressed and resolved to extend support the bharat bandh and APCC have decided to call 10 hors bandh call on September 10 from 5 AM to 3 PM. The bandh call have been given to draw attention of the Prime Minister Narender Modi and BJP President Amit Shah of their ‘Achche din’ slogan given to the people of country and in return the people have given mandate but it have been observed that the said ache din have not come till date. The Indian currency is going down, purchasing power of Indian money is devaluating which have never seen. The price of the crude oil have also gone down but instead of bringing the price down of fuels including cooking gas but it is increasing to manyfold and question where is the achche din. Sanjoy appeal each and every section of society with folded hand to support the Bharat bandh and 10 hours Arunachal Bandh on September 10 as a mark of strongest sign of protest against Arbitrarily price of fuel prices and other subsidiary product which intern will push the price rise of other commodities in state and region and will have consequential effect on the economic condition and to general public. He said all medical ambulance, para military, press, milk van, police, vehicle of magistrates and emergency service are exempted from the preview of the bandh. Further he said since the childrens are also participating the subroto cup at Jullang area and the players and participants will be allowed and are also exempted from the preview of the bandh.